Happy almost Halloween, my creative friends! I love Halloween because it's a time you can really use your creative thought to create all sorts of wonderful home decor pieces. 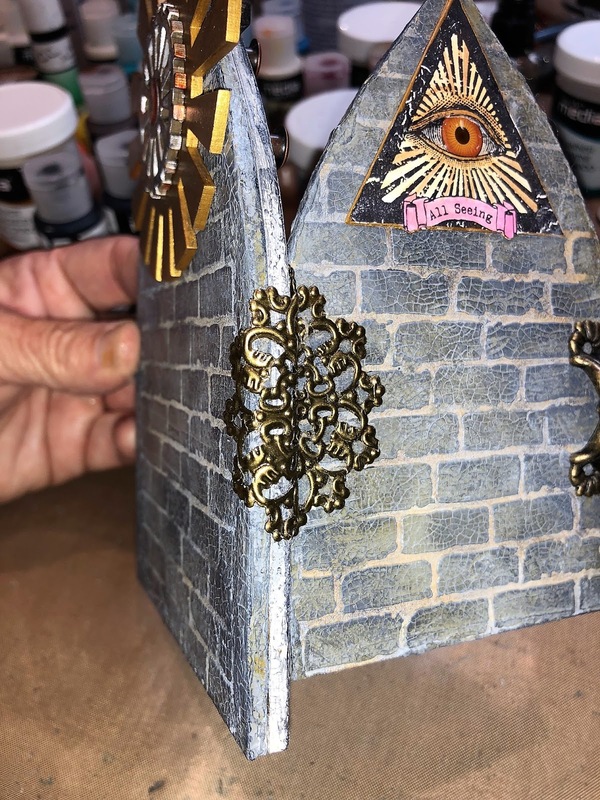 It's so easy to do that with the combination of Andy Skinner products and his Tando Creatives fabulous line of grey board kits! Today I am sharing my latest ghoulish creation with you. I call it the "Sacred Secrets Skeleton Shrine". Say THAT three times really fast! 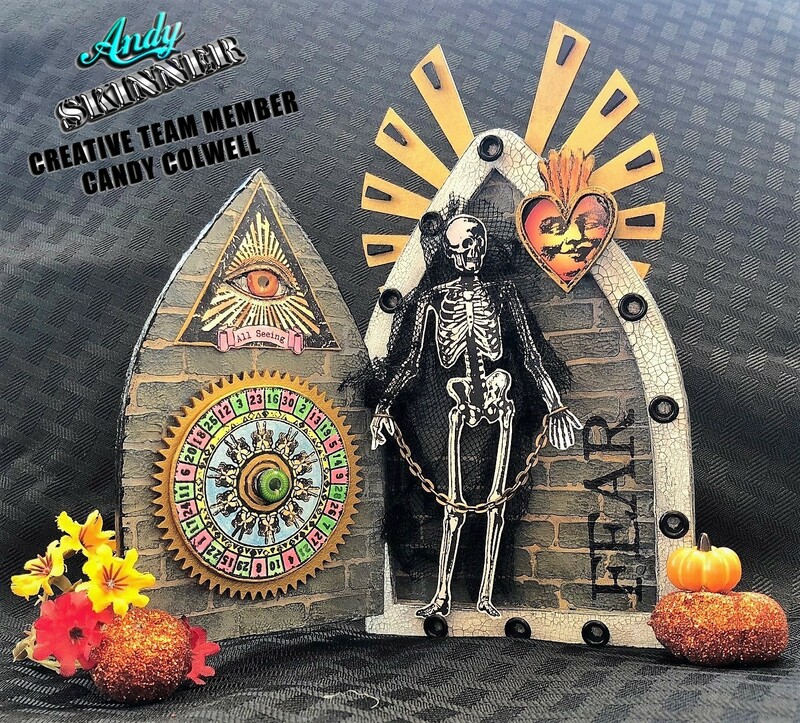 This really came together beautifully with the aid of a few of Andy's stamp sets and DecoArt Media products. Let's get started on this instructional journey and then I'll list all of the elements you'll need to make something like this. Here are just a few of the pieces in this kit. 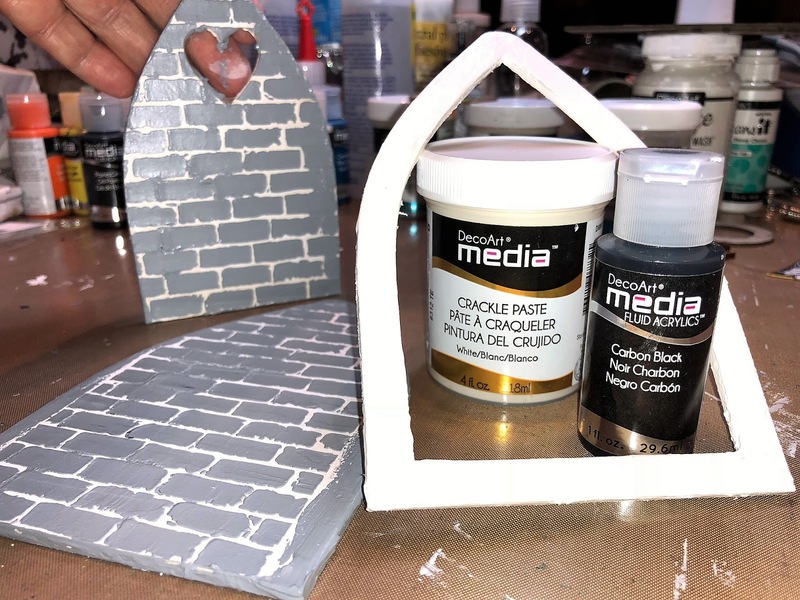 I first gave all of them a light coat of DecoArt Media White Gesso and then mixed DecoArt Media Fluid Acrylics Carbon Black with DecoArt Media White Crackle Paste. 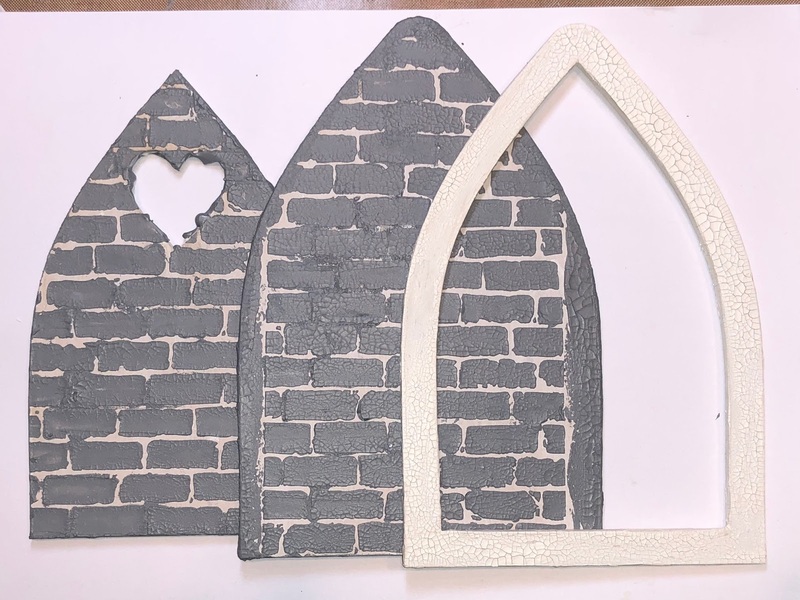 It gave me a lovely stone grey color that I promptly stenciled onto two of the shrine pieces through a brick image stencil. Once dry, I stenciled the back sides of these pieces as well and allowed them to thoroughly dry. Next I brushed a layer of Crackle Paste onto the arch inset adding extra with my finger here and there and on the edges of the arch. This needs to AIR DRY for the crackling to work properly. Here are these pieces at this point. Just look at the lovely texture and crackling! To further "age and weather" the stone look, I rubbed DecoArt Fluid Acrylics Transparent Yellow Iron Oxide all over the stone pieces. I wiped off the excess with a baby wipe and repeated this step until I was happy with the results. Then I added some DecoArt Medium Grey Antiquing Cream to bring back more of the grey tones. Here you see one piece that is finished and the other is not. Quite a difference! 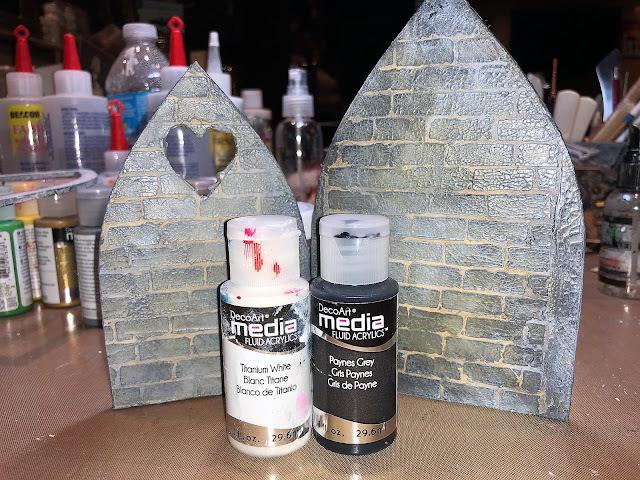 For an even "eerier" appearance, I DRY BRUSHED some DecoArt Media Fluid Acrylics Paynes Grey over the stones (front and back) and then added a light DRY BRUSHING of DecoArt Media Fluid Acrylics Titanium White. Finally, I added more of the dark grey dry brushing in random areas. I love how these walls turned out! Creepy but very cool! I found the perfect solution to cover the heart in Andy Skinner's Curiosity Stamp Set from Stampendous. I stamped four of the triangles onto heavy card stock using Black Permanent Ink. Then cut them out, glued two of them together (to make two triangles), slit at the top of the eyelid and slipped in dimensional eyeballs I found at a local craft store. I glued them in place and then covered them with DecoArt Media Liquid Glass. This seals them with a clear coat and also gives them an eerie dimension. 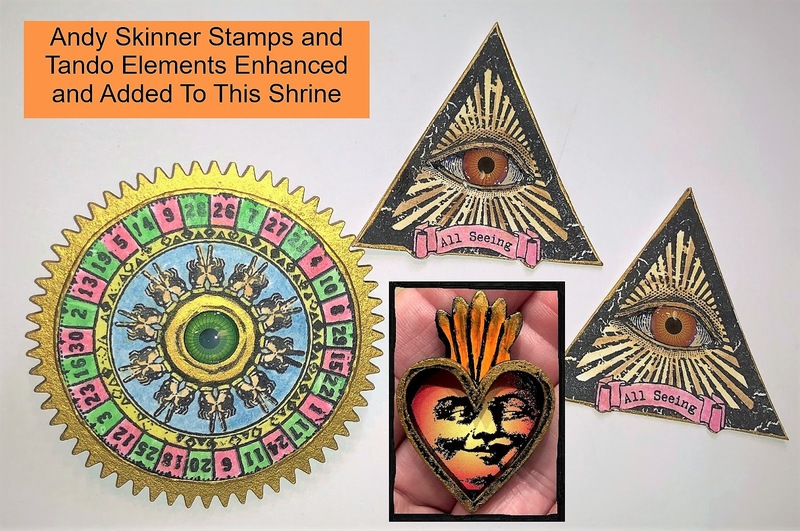 The triangles were then colored using DecoArt Media Fluid Acrylics Transparent Yellow Iron Oxide mixed with a little water to create more of a water color effect and leave all of the black stamping fully visible. Then I added a bit of DecoArt Media Fluid Acrylics Burnt Umber using the same method. Next I stamped Andy's wonderful "wheel of fortune" from the same Curiosity Stamp Set. I colored it using more DecoArt Media Fluid Acrylics in the same manner as above; mixed with a bit of water to make them semi transparent. 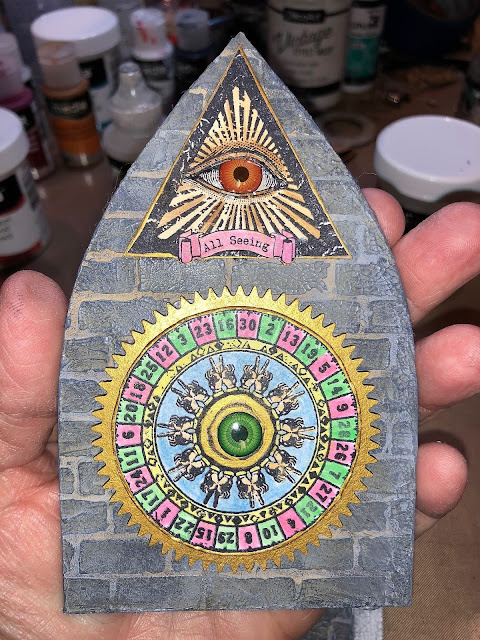 The colors I used were: Cereluan Blue, Primary Magenta, Primary Yellow, Yellow Green Light, Metallic Gold and a mix of Titan Buff, Hansa Yellow Light and Cadmium Orange Hue to create a fleshtone for the little hands in the center of the wheel. I painted the grey board gear from the Sacred Secrets Kit with DecoArt Media Fluid Acrylics Metallic Gold. I cut out the wheel and glued it onto the gear and added a large brad in the center so that the wheel can turn. In the center, I added another dimensional eyeball and topped it with DecoArt Media Liquid Glass. Finally, I added the sacred heart piece. This was painted using DecoArt Media Fluid Acrylics Cadmium Orange Hue and Primary Yellow for the "flame" above. The heart base was painted with DecoArt Media Fluid Acrylics Carbon Black. I used my finger and some DecoArt Media Fluid Acrylics Metallic Gold to highlight the exterior of the heart shape and compliment the "wheel of fortune". The face in the center was a Bottle Cap Image cut to fit the heart. Here is the new and improved shrine door. 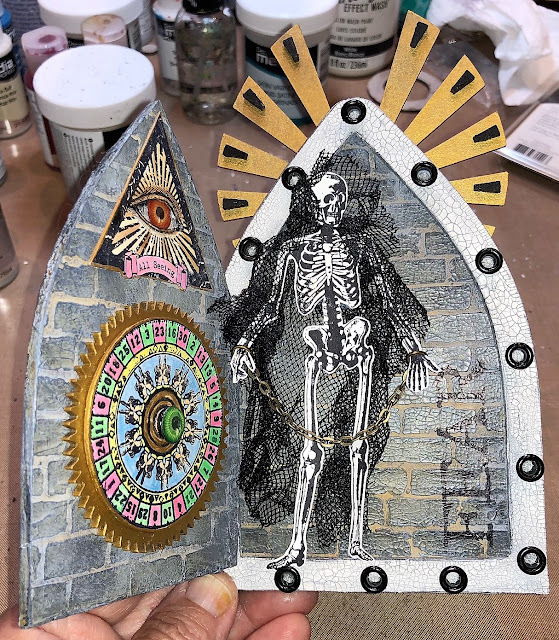 The triangle image is glued onto both sides of the door and the "wheel of fortune" is glued onto the inside of the door. Here is the back side of the main portion of the shrine. 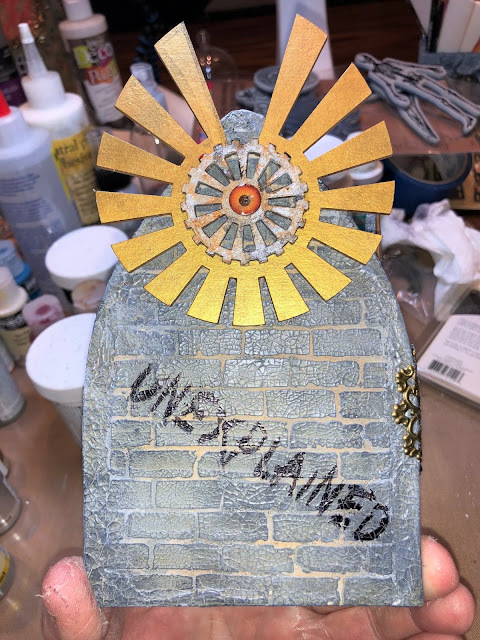 It is enhanced with more grey board elements from the Sacred Secrets Kit. The ray of gold was painted with DecoArt Media's Fluid Acrylics Metallic Gold. 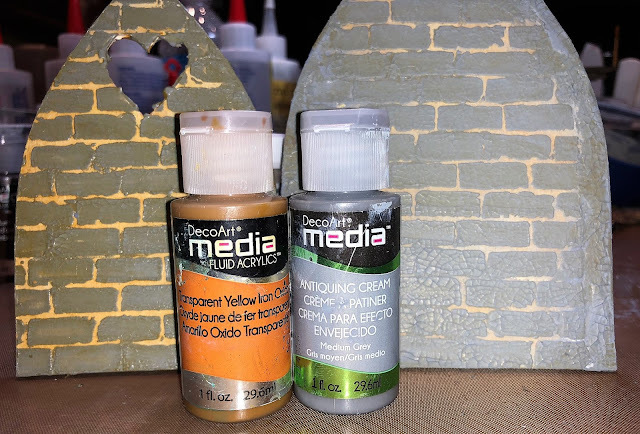 The smaller gear is given a rusted effect using DecoArt Media Fluid Acrylics' Metallic Silver, Carbon Black and Quinacridone Gold rubbed randomly onto the grey board piece. Finally, I added another eyeball in the center and added the DecoArt Media Liquid Glass to give it a more clear, dimensional lift. "Unexplained" is a wonderful added stamp image from Andy's Unexplained Stamp Set from Stampendous. It was stamped using Black Permanent Ink and heat set. To join the shrine body and door together, I added a large decorative metallic piece I had in my stash to use as a "hinge". I also added a small metallic handle on the door using a good glue to hold them in place. Finally for the star of the show; the black clad skeleton. He is from Andy's Birds and Bones Stamp Set from Stampendous. I stamped him onto heavy cardstock using Permanent Black Ink and cut him out. I added the black mesh cloak using a needle and thread around his neck. I also added the chains and handcuffs using a bit of scrap chain and two jump rings. "FEAR" is stamped in Permanent Black Ink right onto the right side of the stone wall. This is from Andy's Skuldoggery Stampendous Stamp Set. Perfect spot for it! I added little black eyelets onto the arch front and the black slips on the golden rays are the remnants that were removed from the gear on the backside of the shrine door. They are painted black and glued in place. Don't throw away what you think might be grey board trash! You never know when it will come in handy!! This project is finished! So fun and really came together easily with Andy's Tando Creative Sacred Secrets as my inspiration. Anne...you are so kind. I so love your work and I am thrilled with your compliments of mine. Thank you, my friend.